Mini venison meatloaves topped with caramelized onions and arugula on toasted ciabatta bread, slathered with sweet ‘n’ tangy maple mustard sauce, will open your mind to unlimited sandwich possibilities! If meatloaf can make an amazing sandwich, the sky’s the limit! With deer season having just recently ended, and all of our deer coming back from the processor now – I am in recipe-idea-high-gear. While I have a pretty good arsenal of venison recipes, and we definitely have our favorites that we repeat quite a bit, I am always looking for new things to try with it. There was something about the sound of ‘meatloaf sandwich’ that made me pause for a minute. I mean, we love a good meatloaf at our house, especially venison meatloaf, but it took me a minute to wrap my head around putting it between bread. But, being the adventurous person (and sandwich-lover, extraordinaire) that I am, I decided that we were going to try it! I mean, meatloaf has burger-like qualities, and everyone loves a good burger – so a meatloaf sandwich would have to be at least as good. Right? Yes. 100-percent, yes. And! Because these are mini meatloaves, it doesn’t take nearly and hour to cook them!! Nope. Try less than 30-minutes and you will be shoveling this ciabatta-surrounded deliciousness into your pie-hole. Mmm, pie sounds good too. But, I digress. J was a big fan. BIG, big fan. Probably in part because I made caramelized onions, especially for his. Because, you know this girl doesn’t do most onions. I’m pretty sure we both oohed and aahed our way through dinner, then I posted pics so my social media family could share in the drooling. See how nice I am?? And now, here I am sharing the recipe with you. Because I love ya, and I don’t want you to miss out on this amazing sandwich. And, in case you forgot, tomorrow is Superbowl Sunday. 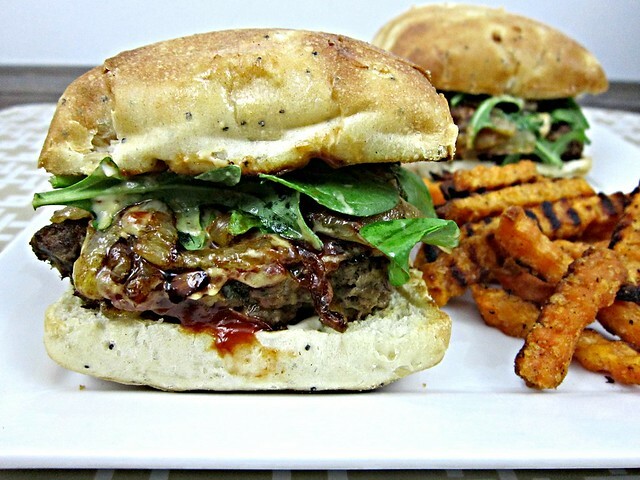 And… I think meatloaf sandwiches (or sliders, even!) would make an excellent addition to any #gameday get together!! Mini venison meatloaves topped with caramelized onions and arugula on toasted ciabatta bread, slathered with sweet 'n' tangy maple mustard sauce, will open your mind to unlimited sandwich possibilities! If meatloaf can make an amazing sandwich, the sky's the limit! In a bowl, mix together the panko, parsley, milk, Worcestershire sauce, egg, mustard, garlic, and salt. Add in ground venison and mix with your hands until just combined, but don't overmix. Heat oil in a 12-inch, oven-safe skillet (I used cast iron). When the oil is hot, add the meatloaves and cook until browned on each side, about 3 minutes each. Meanwhile, whisk together the ketchup and Worcestershire in a small bowl. Spoon over the top of the mini loaves, then place the skillet in the oven and bake for 15-20 minutes, or until cooked through. While the meatloaves are in the oven, melt butter in a medium skillet over medium-high heat. Once melted and bubbling, add the onion and reduce the heat to medium-low. Sauté, stirring occasionally until they are caramelized and golden brown. Remove from heat and set aside. Also while the meatloaves and onions are cooking, stir together the maple syrup and mustard. Taste and add more maple syrup if you want it a little bit sweeter. Set aside. When the meatloaves and onions are just about done, toast your Ciabatta rolls, and spread some mayo on each of the bottom rolls. 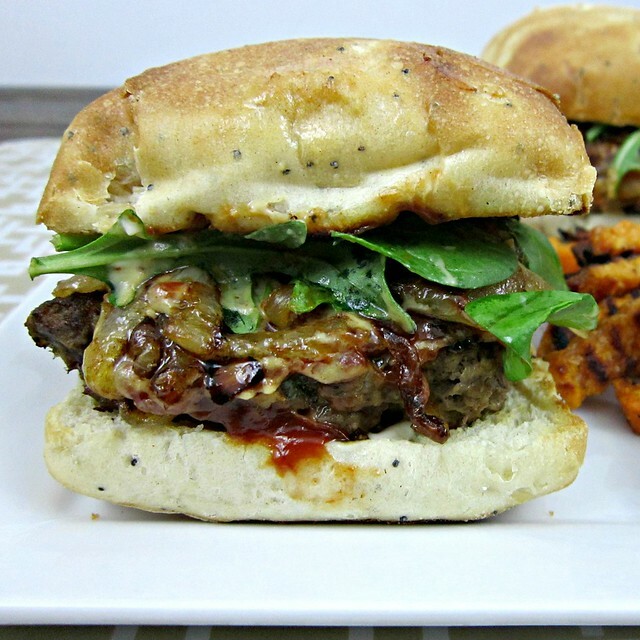 Then place your mini meatloaf on the bottom roll, drizzle with maple mustard sauce (or put this on the top roll if you prefer), then caramelized onions, arugula, and the top roll. Serve immediately with your favorite side – we love sweet tater fries!